Max. Total Tablet Diagonal Size: 13.25"
Min. Total Tablet Diagonal Size: 8.75"
Max. Total Tablet Thickness: 0.5"
The Tether Tools AeroTab Universal Tablet Mounting System S2 is the standard size version in the AeroTab Series. The streamlined design ensures a secure fit on the corners of smaller tablets. Engineered with a secure corner to corner diagonal brace, the AeroTab keeps a tablet's screen, as well as all buttons, cameras, speakers and ports open and accessible. 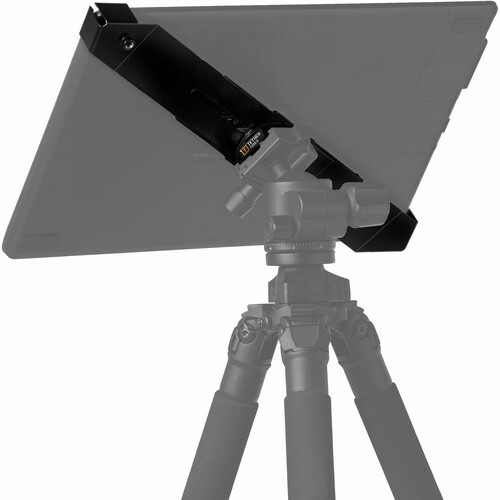 The tablet can be rotated and mounted in portrait or landscape orientation. Once the tablet is placed in the diagonal extension, all you have to do is slide the non-slip, scratch proof padded corners onto the tablet for a tight fit. Using the circular bracket on the back, you can tighten the mount so the diagonal slide is locked in place and the tablet is securely resting in the AeroTab. Then simply attach the AeroTab bracket to the tripod, stand or arm of your choice and lock down for a secure mount. The AeroTab S2 features a sliding design that will hold a tablet with a diagonal (corner-to-corner) length from 8.75" to 13.25" and it accommodates tablets up to 0.5" in thickness. The collapsing design makes the AeroTab S2 compact and portable for easy travel. Plus, if you already have a protective case on your tablet, the AeroTab S2 will work with most existing protective enclosures as long as the dimensions fall within the above ranges. The AeroTab S2 has a 1/4"-20 tripod thread which is compatible with all tripods as well as a built in Arca-style receptor for mounting the AeroTab on compatible Arca style ball-heads. The AeroTab S2 features all the versatile functionality of Tether Tools LoPro2 ProBracket and is compatible with many 1/4"-20 arms, vacuum mounts and various other grip gear. An additional 1/4"-20 receptor on the back allows you to attach a camera sling strap or belt clip designed for cameras. It can also be used to add a light, microphone, recorder, receiver, or other accessory. Box Dimensions (LxWxH) 14.4 x 4.8 x 4.4"
The clip to grip on the tripod (the last picture) what's it called? For use as shown in the first photo, will I need to purchase anything further if I'm already purchasing MeFOTO BackPacker Travel Tripod (White) B&amp;H # MEA0350Q0W MFR # A0350Q0W ? Please advise. Thanks! Nothing additional is needed. You will screw the tripod plate that comes with the tripod into the back of the AeroTab S2 and then mount to your tripod as normal.